Sip your morning coffee on the pebbly shores of Loch Lomond, with a dusty pink sunrise and a morning breeze; hike through pine trees to the highest peak in Southern Scotland, Ben Lomond, looking out onto a landscape of mountain layers and scattered lochs; take a little wooden boat across to isolated Inchcailloch Island where the forests are wild and deer gaze at you hidden beneath a bed of thick fern. Scotland’s most southerly National Park, situated only half an hour from Glasgow, Loch Lomond and the Trossachs is easy to reach and has an array of stunning landscapes; from the shores of Loch Lomond to the higher, more barren mountain peaks and the rich forests of the Trossachs area. The famous walking trail, the West Highland Way, runs directly through the National Park, so it’s not uncommon to see hikers a-plenty, especially in the summer months. The park has a number of other outdoor activities to enjoy; particularly popular for mountain biking, wild swimming and watersports. 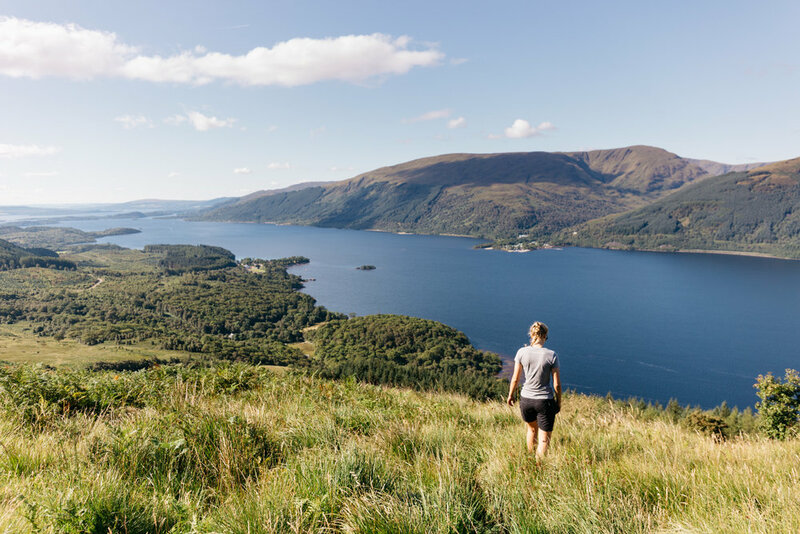 Falling for Loch Lomond can happen at any moment; with a glowing orange sunset or upon reaching your first summit stones - eating Scottish smoked salmon looking out onto a view of snowy hills or riding mountain bike trails through the forests of the Trossachs. N.B. Due to the high number of visitors, there are wild camping restrictions on the eastern side of Loch Lomond from 1st March to 31st October. Please respects these by-laws, aimed to help protect and conserve the stunning natural systems in the National Park. Find more information here. 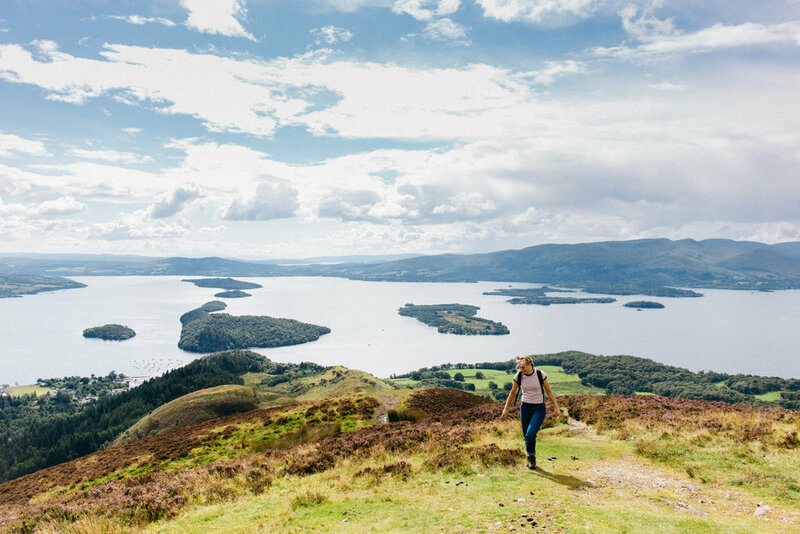 One of the National Park’s ‘Wee Hills with Big Views’, Conic Hill begins in the village of Balmaha and follows a short but fairly steep track to the summit. After walking through a forest of pine and ferns, views begin as early as a third of the way up; looking out onto beautiful Loch Lomond with its many scattered islands and the layers of hills and mountains of the Arrochar Alps in the north. An easy and accessible walk; the perfect way to begin your stay in the National Park. Getting there: Park in the free carpark at the visitor centre in Balmaha. The walk begins from the corner of the carpark. Alternatively, take the 309 bus from Balloch to reach the carpark. Hike: The hike is 2.5 miles with a 350m ascent. It is well-marked, but you can use OS Explorer Map OL38 or see a detailed description of the walk here. Gear: The path is clear though can be boggy. We’d recommend walking boots or sturdy trainers, and bring a raincoat as the weather is always be unpredictable in Scotland. Food & Drink: There is a coffee shop, corner store and pub in Balmaha - plenty of options to eat before/after the walk or to pack a picnic for the summit. Part of a National Nature Reserve, Inchcailloch is Loch Lomond’s most accessible island; a leafy oasis of flora and fauna - low ferns, tall trees and if you're lucky you may spot a deer hiding amongst it all. There is a small campsite on the island, reached by following a footpath from the dock to a small and isolated bay. 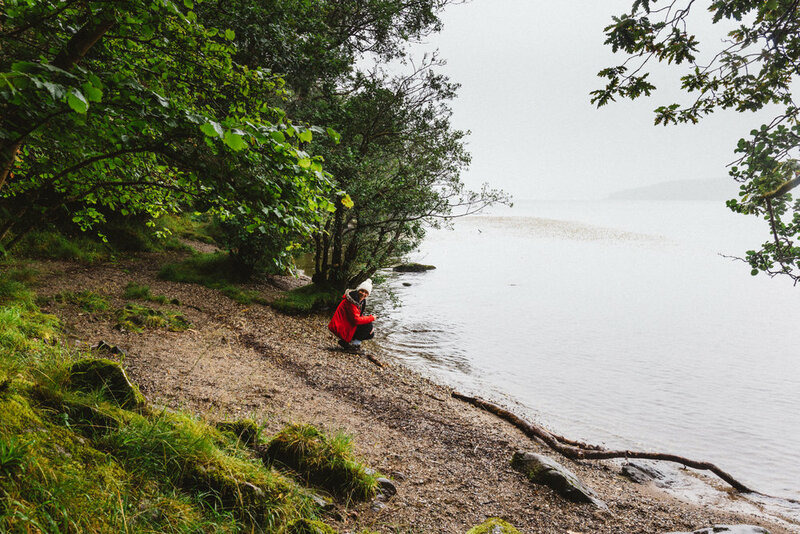 Though it’s only a five minute boat ride from Balmaha, on the shores of Loch Lomond, Inchcailloch is perfect if you're seeking some quiet and isolation in a natural and wild place. Getting there: The ferry to the island runs on an ‘on demand’ basis from Balmaha and costs £5 return. You can park at the visitor centre at Balmaha for free. Camping: The campsite is open from March to October, limited to 12 people and maximum group sizes of six. We'd recommend booking a pitch in the busier months. See website here. Facilities: The island itself has no stores and only basic toilet facilities. If you’re camping on the island, stock up on food at the store in Balmaha, where there is also a cafe and pub. Ben Lomond is Scotland’s most southerly Munro, standing proudly over Loch Lomond at 974m. Being within easy access of Glasgow, it is Scotland’s busiest mountain - which in most cases would not warrant a recommendation from us! 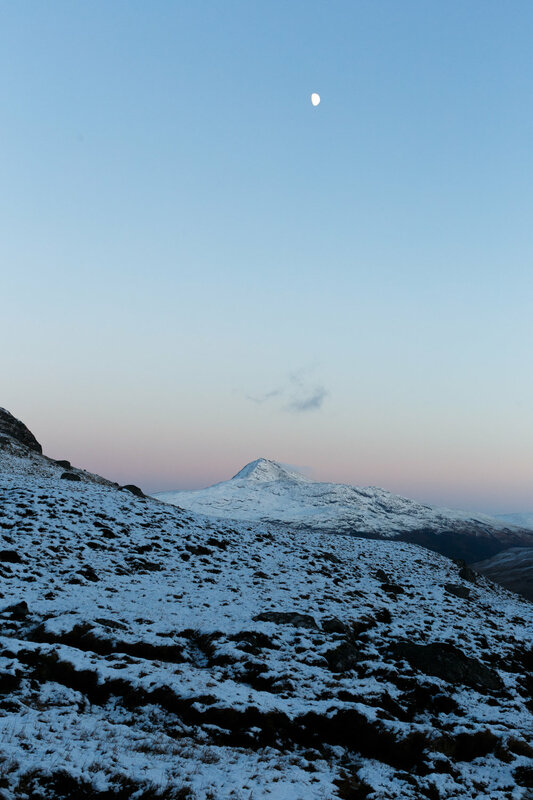 However, tackling the mountain via the Ptarmigan route means skipping the crowds and being rewarded with stunning views down to the loch and to more mountainous views of the Arrochar Alps in the north. Descend via the tourist path to complete the circuit, making for an excellent and strenuous day-walk in the National Park. Getting there: Park at the carpark in Rowardennan, just north of Balmaha. There are toilet facilities here. Hike: The distance of the full circuit, taking the Ptarmigan route to ascend and the tourist track to descend, is 7 miles with a 950m ascent - around 5 hours of walking. Use OS Explorer Map OL39, our digital OS mapped route here or see a detailed description of the walk here. Gear: For the Ptarmigan route, wear walking boots and bring waterproofs and warm clothing as even in the summer months the wind can be strong and the weather unpredictable at the summit. If taking the tourist path there and back, trainers will suffice. Food & drink: Bring plenty of food and water for the walk. There is a store, cafe and pub in Balmaha. The largest freshwater loch in Scotland, Loch Lomond is 24 miles long and crosses the Highland Boundary Fault. Over 30 enticing islands can be found within the loch itself, while some of Scotland’s most beautiful hills and forests stand proudly at its edges. We recommend catching one of Scotland's stunning sunsets or sunrises in one of the bays or campsites along the shores of Loch Lomond. Indeed, there is not much better than sitting with a coffee in hand, watching the first of the day’s sun rays cast their glow onto the highest peaks; or ending the day seeing the skies change from orange to pink to a deep shade of purple, reflecting glowing light into the gently lapping waters. 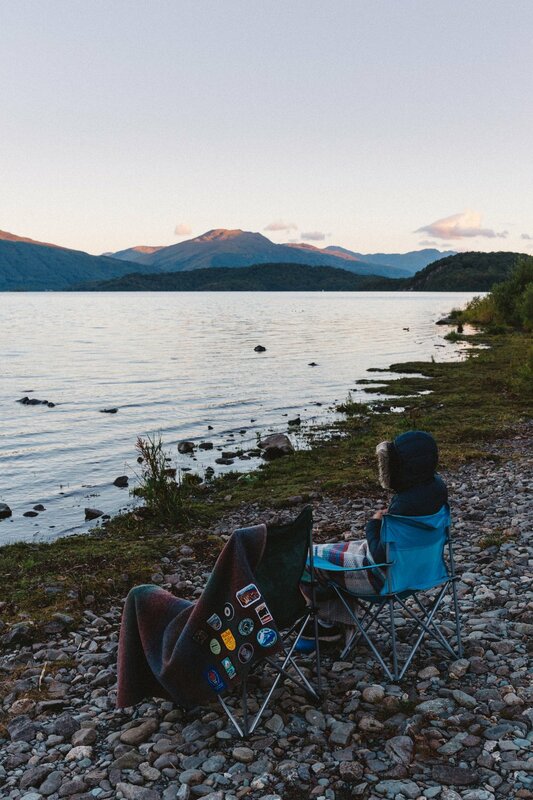 Camp: Due to the high number of visitors to the National Park, there are wild camping restrictions on the eastern side of Loch Lomond between 1st March and 31st October. 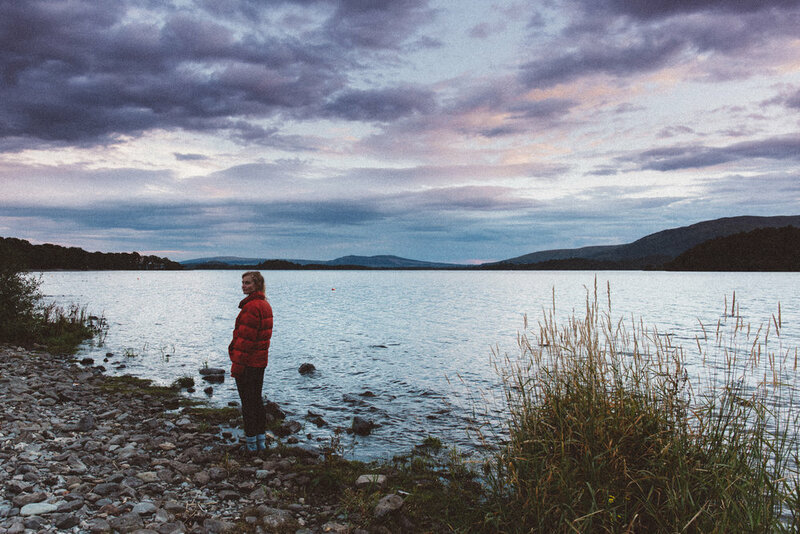 As a result, we recommend choosing one of the designated campsites like Sallochy or Milarrochy Bay. Sallochy: Sallochy has basic facilities - drop toilets and no drinking water or showers. The campsite is tent-only, peaceful and small. Recommended for small tents and people who prefer more primitive camping. Stop at the visitor centre in Balmaha to reserve your pitch or book online here. Milarrochy Bay: Milarrochy Bay campsite is open to tents, caravans and other vehicles. There is a large shower and toilet block and drinking water. An onsite store sells basic products like milk, cans of food and fresh bread and pastries throughout the day. The campsite is busier and noisier than Sollochy, but it is a great location for some of the National Park’s best walks and for those doing the West Highland Way. 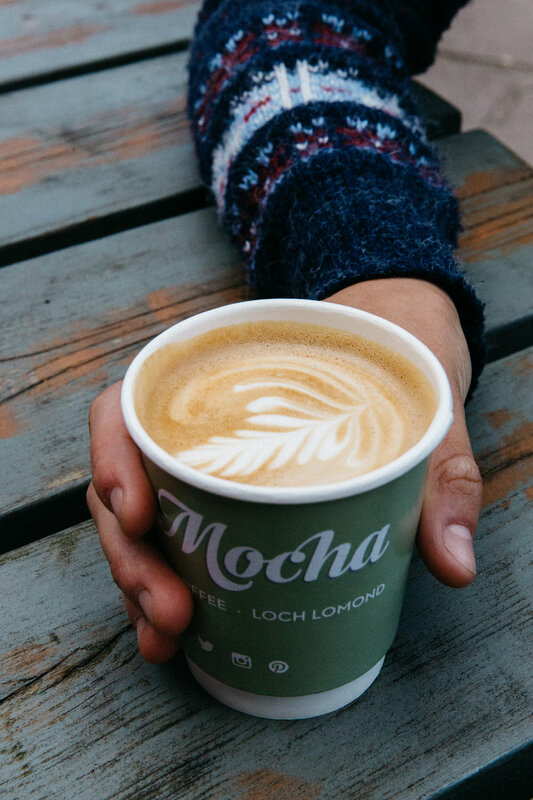 St. Mocha serves delicious coffee supplied by ethical Scottish roasters, in a lovely little location close to the harbour at Balmaha. The cafe itself is cosy and rustic; with sofas, a log-burner, shelves of books and a large amount of Scottish tartan. Serving cake, coffee, light meals and homemade ice cream, the cafe can be busy in the summer months with visitors to Inchcailloch Island and Conic Hill, as well as West Highland Way hikers. We'd suggest getting your coffee and cake to takeaway and sitting somewhere peaceful, watching the boats gently bobbing up and down at Balmaha harbour or driving to Milarrochy Bay picnic area. Getting there: Situated in Balmaha on the Eastern shores of Loch Lomond. Park for free at the visitor centre. Opening times: The cafe is open 10.00 - 17.00, Monday to Sunday. A hike up The Cobbler (also known as Ben Arthur) makes an excellent day-walk in the Arrochar Alps, with breathtaking views down to Loch Long, Ben Lomond on the other side of the valley, and a number of surrounding peaks and forests. Starting from the carpark at the northern point of Loch Long, the hike begins by ascending a windy path through Argyll Forest Park (signposted from the road) before the landscape opens up and the peak of The Cobbler with it's distinct, jagged shape (almost resembling the Cerro Torre of Patagonia!) can be seen looming in the not-so-far distance. Summit views won't disappoint on a clear day, with winding lochs, thick forests and mountain peaks all in sight. Getting there: Heading up the western edge of Loch Lomond, turn left at Tarbet and park at Loch Long carpark (£1 all day). Hike: From the carpark, head west crossing the A82 and heading into the Argyll Forest Park (signposted). Follow the path through the forest, then continue once you come out onto the moors. Pass the Narnain Boulders before reaching a junction of two paths. Turning left heads directly to the summit along a steep, jagged path, while heading straight before turning left after another 15-20 minutes of walking (0.7 miles, just after a small lochan on your right) takes a path around the back of the mountain, where views of Beinn Narnain and Beinn Ime are breathtaking. We recommend heading up the back way, and down the more direct route for the best views. Descend on the same or alternate path and return through the forest back to the carpark. Find a full description of a route on Walk Highlands here (for back route, continue straight at the junction then turn left after a lochan on the right). Gear: We recommend walking boots due to the rough terrain to the summit, and bring waterproofs and warm clothing as the weather can be unpredictable. Food & drink: Grab a breakfast sandwich and piece of cake to take with you to the summit at the cafe at Mactavish's Service Station across from the carpark. Head to The Village Inn by the Loch after your hike. We're still exploring Loch Lomond & The Trossachs and discovering great places to share with you.